Into the Woods › Buffalo: Who knew? I was Googling for ideas for what to do with Quorn faux-chicken cutlets. I came across chicken breasts in Buffalo sauce with mozzarella. Hmmm. But what the heck is Buffalo sauce? A little Googling revealed Buffalo sauce to be a zesty sauce served with chicken wings. It originated in Buffalo, New York. I put two and two together and also surmised that “Buffalo wings” must have gotten their name from Buffalo, New York. Googling showed that to be true. The Quorn faux-chicken cutlets are the most difficult form of Quorn to deal with, I’ve found. It’s hard to overcome Quorn’s dryness and mealy texture. The faux chicken nuggets, and the faux ground beef, are easier to deal with — if nicely sauced. Except for the Quorn, the supper above is very local. The greens and peppers came from a neighbor’s garden. 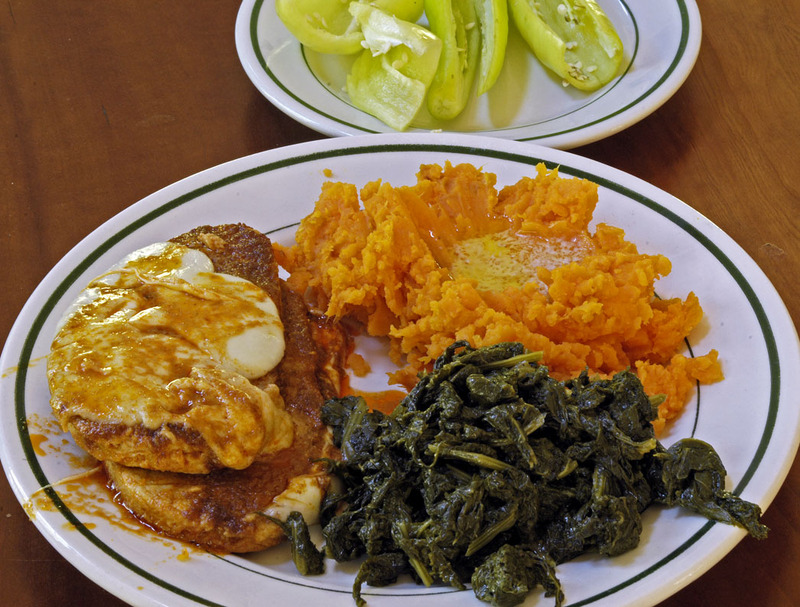 The sweet potato came from a sweet-potato farm just up the road. That’s Buffalo china in the photo, in addition to the Buffalo sauce. Buffalo china was made in Buffalo, New York. My post on Buffalo china is the most Googled post I’ve written here in more than ten years of blogging. Buffalo china is simply the best commercial china ever made. The abbey’s everyday dishes, bought piece by piece on eBay, are Buffalo china. This was written by daltoni. Posted on Wednesday, October 17, 2018, at 4:22 pm. Filed under Culture, Food. Bookmark the permalink. Follow comments here with the RSS feed. Trackbacks are closed, but you can post a comment. Hi David, Buffalo sauce here in Buffalo is butter and Franks hot sauce usually on fried chicken wings. The more Franks you put on, the hotter. A Buffalo favorite.Great to hear you mention Buffalo.